Few Truths About Our Heart. 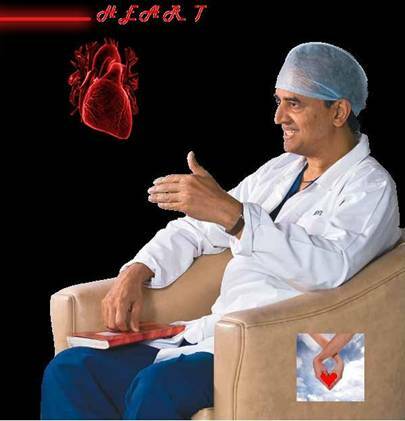 A Heart Specialist Opens His Heart In An Interview. An Email I Just Received In My Inbox. Have a good and healthy heart. It was arranged by WIPRO for its employees . The transcript of the chat is given below. Ans:1. Diet – Less of carbohydrate, more of protein, less oil. Qn: It’s still a grave shock to hear that some apparently healthy persongets a cardiac arrest. How do we understand it in perspective? Qn: Does cholesterol accumulates right from an early age(I’m currently only 22) or do you have to worry about it only after you are above 30 years of age? Ans: You tend to eat junk food when the habits are irregular and your body’s enzyme release for digestion gets confused. Qn: Which oil is better – groundnut, sunflower, olive? Qn: What is the routine checkup one should go through? Is there any specific test? Ans : Yes, co-sanguinity leads to congenital abnormalities and you may not have a software engineer as a child. Ans : Yes, most drugs h ave some side effects. However, modern anti-hypertensive drugs are extremely safe. Qn: Do, in any way, low white blood cells and low hemoglobin count lead to heart problems? Ans : No. But it is ideal to have normal hemoglobin level to increase your capacity. Qn: Is there a relation between heart problems and? Qn: Are people working on night shifts more vulnerable to heart disease when compared today shift workers? Qn: Does aspirin or similar headache pills increase the risk of heart attacks? Ans : Eat a healthy diet, avoid junk food and non-veg, exercise every day, do not smoke and, go for health checkup s if you are past the age of 30 ( once in six months recommended) …. Have a Good And Healthy Day! Thanks for dropping in, and for the comment. All you have to do is to select from the abdominal exercise macines the one that suits you best. If you can not find the time to work out in a gym, and you have decided not to forgo your exercise regime, the wisest alternative is to buy the best equipment you can conveniently use at home.